A new government method of measuring poverty takes into account many factors the old rate didn’t: geography, taxes, government benefits, housing costs and other expenses. 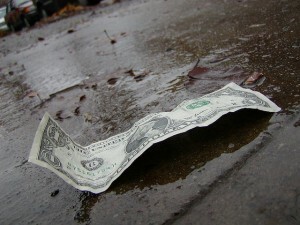 For D.C., this means many more people would qualify as poor due to the city’s high cost of living, DC Fiscal Policy Institute analyst Jenny Reed said on Thursday’s Kojo Nnamdi Show. “Here in the District, we’ve seen median rent actually rise by 35 percent over the last 10 years, and incomes, at the same time, have only grown by 15 percent. So our costs of living are growing very rapidly,” Reed told Nnamdi. While housing prices have been slow to recover in the wake of the recession, the District is one of the only cities where home prices increased from 2010 to 2011. Renting has gotten more expensive in the past year, too. Under the new nationwide rate, poverty among children decreases while increasing for seniors. This is because government assistance families with children receive count as income. Meanwhile, out-of-pocket medical expenses paid by seniors count against them, so poverty among that group rises under the new rate. The drop in childhood poverty shows social safety net programs are helping children, but more needs to be done for seniors, the Urban Institute‘s Sheila Zedlewski said on Thursday’s Kojo Nnamdi show. A state-by-state breakdown of the new measure isn’t yet available, but regional data show western states have the highest rate, followed by the southern region. Experts on Thursday’s Kojo Nnamdi Show spoke about the ramifications of the data and why poverty measures are important — for example, they determine who’s eligible for government assistance programs. You can listen to the entire segment here. Anacostia is a predominately African American area east of the river. But it wasn’t always that way. The two neighborhoods that make up Anacostia’s historic core are Uniontown, which was home to white Navy Yard workers, and Hillsdale, an all black neighborhood where newly freed slaves settled and eventually became quite well-to-do. Over time, white flight, urban blight and desegregation changed the face of Anacostia. Pedestrians pass by a homeless man as he rests with his belongings on K Street, NW. How are the poor treated by the media, politicians and society? 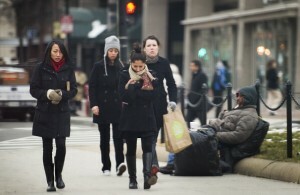 Experts on Wednesday’s Kojo Nnamdi show discussed the state of poverty in America and popular perceptions of the poor. One of the reasons that people don’t get distressed by the gulf as we’d think they would is they’re deeply cynical and pessimistic about public investment and public involvement. And so, even if they think,’Well, maybe it shouldn’t be this way,’… they think that anything we could do to fix it might be worse. An interesting debate then ensued as to whether public assistance programs help the poor, or whether they contribute to the cycle of poverty. The whole segment is well worth a listen. Go-Go In D.C.’s Neighborhoods: Soon To Be a Thing of the Past? 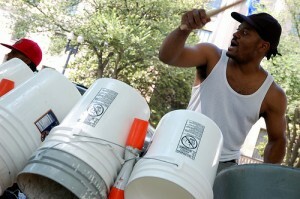 D.C. street musicians play go-go, but full-fledged city shows are becoming more and more scarce. This post comes to us courtesy of Anne Hoffman, an intern producer for the Kojo Nnamdi Show. Nnamdi will discuss the past, present and future of go-go at 1 p.m., Thursday. “If go-go stopped, I don’t even know,” says musician Sweet Cherie, “it would be like Armageddon or something.” But go-go, for some the heartbeat of Washington D.C., the city’s answer to a regional sound, is losing territory. For many years now, go-go venues have been shut down inside D.C. due to club violence and liability issues, pushing the music further out into the Maryland suburbs like Prince George’s and Charles counties. Meanwhile punk rock, another D.C. musical mainstay, is not experiencing the same bad luck.